In the popular imagination, “big business” is responsible for climate change. 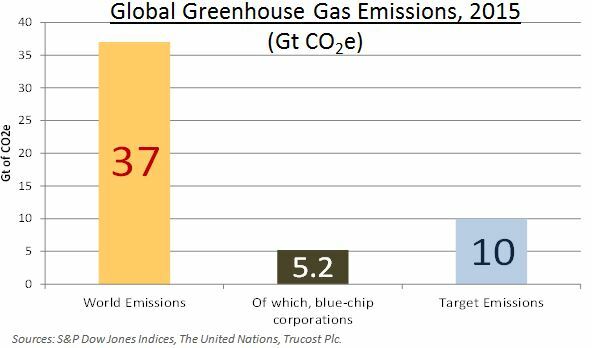 In fact, corporate emissions of greenhouse gasses are a small part of the problem; it is quite possible that corporations also provide our best hope for a solution. The current reality – what we know to be true – is that governments worldwide are shortly expected to commit to limit their emissions of greenhouse gasses, sufficiently for the global average temperature to rise no more than 2° C above pre-industrial levels. While the world’s political leaders have been quick to advertise their commitment to this laudable goal, they have so far been reticent in explaining exactly what might be required to meet it. According to the U.N., the world produced around 37 gigatonnes (Gt) of greenhouse gasses in 2015. Scientists estimate we can produce roughly another 1,000 Gt of further emissions in total and yet remain within the 2° C limit. If we allow ourselves 100 years to come up with a technological solution, that implies an annual budget of 10 Gt per year; an annual reduction of around 27Gt. In context, the world’s blue chip corporations – identified via their inclusion the S&P Global 1200 – account for around 5.2 Gt per annum in aggregate. A change to corporate emissions patterns may be necessary, but it will not be sufficient. Moreover, as we have indicated, the existence of a non-zero “target” for near-future greenhouse gas emissions is predicated on the future discovery of alternative technologies, capturing and removing carbon from the atmosphere or replacing our energy sources (and allowing, in our example, for the budget to last only 100 years). More aggressively, several proposals for emissions targets assume a pace of discovery that results in negative net emissions during the second half of this century. Venturing briefly into the realm of speculation, it seems rather likely that the actions of large corporations seeking new and cleaner sources of energy will be critical in developing the technology and infrastructure to support it. The conversation around climate change has a propensity to become mired in polemic, politics, and accusations of bad faith. This is a shame. It is quite possible to examine the current trends in the light of objective and impartial data. Through the range and scope of our indices, S&P Dow Jones Indices can provide data on where the impact might be felt, and which investment styles may benefit. Such analysis of the make-up, importance and distribution of corporate emissions is provided in our latest paper: the S&P Dow Jones Indices Carbon Emitter Scorecard.